Gerard Love has one hell of a sweet voice. Some fans will argue that it was the best one in Teenage Fanclub: a soft, sugar-sweet tone that was born to sing such charming power pop. He's sung and written many of the band's best tunes — "Discolite," "Time Stops," "Radio," "Ain't That Enough" — and so it was a shock to TFC fans when the bassist decided to exit the band last fall. All of a sudden, one-third of the harmonies in a band known for its harmonies was gone, following a run of UK shows celebrating the band's storied Creation years. And so when Teenage Fanclub returned to Toronto, it was hard not to notice the absence of a founding member. 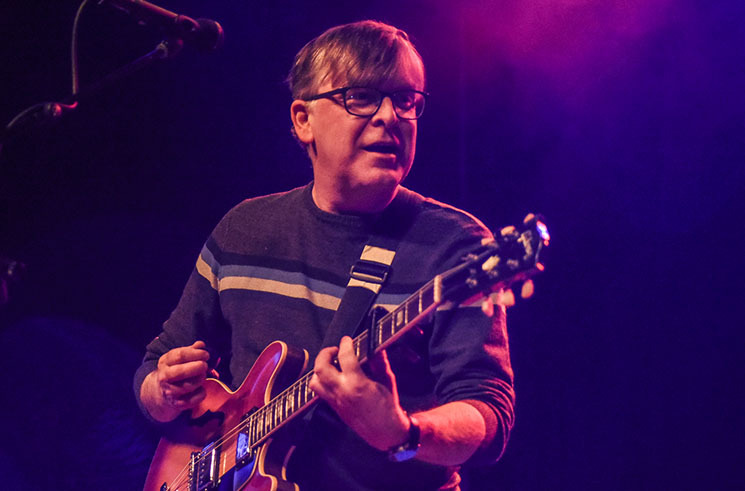 Credit Norman Blake, Raymond McGinley and long-time drummer Francis MacDonald, however, for making adjustments to fill such a gaping hole: regular touring member Dave McGowan has been moved from keyboards to bass, which cleared the way for Euros Child, of the late, great Gorky's Zygotic Mynci, to play keys and sing backup. If Fleetwood Mac can do it, why can't the Fannies? Beginning with their trusty opener, Grand Prix's "About You," the band were quick to instil fans with the comforting sensation they've built a career on. They next gave Songs From Northern Britain's "Start Again" some welcome distortion, which carried into Thirteen's "The Cabbage," though unfortunately that song's killer slide guitar bit didn't survive the noise. Three classics to kick it off was a good start. Blake mentioned a recent trip to Hamburg to do some recording, which produced "Everything Is Falling Apart," a new McGinley-led single that is a sign of good things to come. Child, who was introduced as "Wales' answer to Richard Clayderman," filled in nicely on backing vocals. He assisted Blake on Bandwagonesque's "Alcoholiday," who struggled hitting some high notes, as well as McGinley, who ended up just skipping them on "My Uptight Life." Of course, the set list omitted any Love compositions, respectfully, but there was careful consideration taken to appease those fans who weren't sure if they could pull this off. McGinley went with "It's A Bad World," "Verisimilitude" and "Your Love Is the Place Where I Come From," featuring Blake on glockenspiel," while Blake chose "Planets," "I'm In Love" and duetted with MacDonald on "I Don't Want Control of You." After announcing the encore, in which "we'll do the pretend-to-go-off thing," they got the loudest cheer of the night as they launched into the Bandwagonesque favourite, "The Concept." By this point Blake's voice was getting a little scratchy, but thanks to the crowd joining in, it was hardly noticeable. One 30-second encore and Blake came out with his million-dollar smile, acknowledging how Toronto is practically a hometown show for him (he lives about an hour away in Kitchener-Waterloo). "Since we're in Canada we're gonna play a song by a Canadian artist Neil Young," he announced, as the band played Crazy Horse's "Don't Cry No Tears." Following that was "The Fall" from 2009's Shadows, which fell victim to some feedback issues. Bidding farewell by saying hi to his family and neighbours, Blake introduced fellow hometown hero Brendan Canning (Broken Social Scene), who came out strapped with a hollow body to help perform their signature closer and debut single, 1990's "Everything Flows," which had the crowd singing its chorus refrain till the end. Despite an off night plagued with sound troubles and notes that were either flat or even just avoided, Teenage Fanclub proved that their world'll be okay. Love will be greatly missed on forthcoming recordings and tours, but when it comes to this band, two out of three ain't half bad. And if they really want to spice things up, Euros Child seems primed to fill Love's spot, should they choose to make it a power trio again.